(see Part I- “Abandoning Idol…“)… which brings me to the show that’s very quickly replacing American Idol in the ratings and has long since replaced it in the minds and hearts of discerning, modern audiences. The Voice. 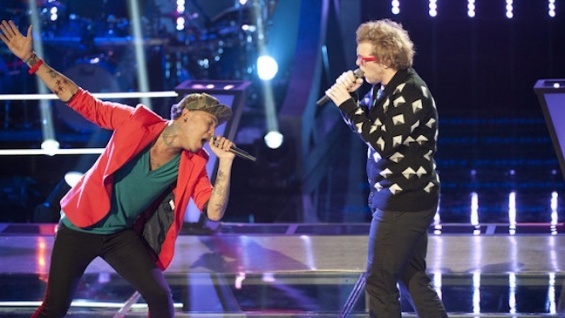 The high-concept competition was a risk for NBC and the format, though a good one, could have done them wrong. While the blind auditions do refocus the story onto the role of the “singer” over the “character”, once that round is over there’s always going to be the reality of the court of popularity contest opinion. But The Voice doesn’t seem to buy such a defeatist conceit, something never the more clear than in the elated look on Adam Levine’s face when he turns his chair around to find someone belting their heart out- even if they are 50+ and strange looking. There’s an open-hearted optimism to The Voice (maybe it’s the invited-audition setup that eliminates the bad singers and thus eliminates the element of mocking that’s so common in Idol‘s early weeks), you get the sense that the coaches really are there to help and support their teams, that they really are rooting for the contestants’ success and not just selling themselves to the audience. 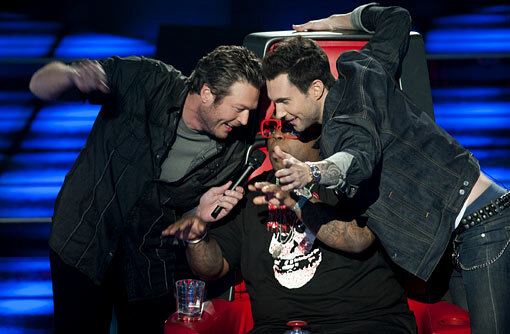 Despite host Carson Daly’s awkward/forced friendliness, the early rounds of The Voice set the auditioners up to be as comfortable as possible- so they perform better. There’s no camping out all night, no giant lines to wait in, no horrible folding chairs and pin-on numbers; instead, there’s a Starbucks bar, plenty of couches and makeup and hair teams to make sure no one looks ridiculous (even if the judges have their backs to the stage). There’s no Hollywood week that forces the singers to pull all-nighters with people they don’t like so they can synchronize their step-touches. Instead, there’s Battle Rounds where the coaches assign a song to two performers, give them one-on-one coaching, bring in big name mentors (the best of the season- Idol victor/ship jumper Kelly Clarkson) and root for both singers before being forced to pick a winner. It’s an almost humane process, and that never happens on reality TV. Because the format was a risky one, what NBC did right, the key to The Voice‘s success, is the current-hit-maker panel of clever, funny, competitive and expert judges. I’ve never heard a Blake Shelton song, but I’m a big fan of his existence based entirely on his clever judgement, pervading warmth, quick wit and surprisingly eclectic taste that he displays on The Voice. He’s funny in a grounded way and legitimately helpful in whatever way he can be. Christina Aguilera is too. She’s gotten a lot of grief for some reason, people think she’s the weakest judge, but Christina’s got a lot to give her team members and she’s doing a great job this season of putting her strengths to good use. Her team is actually my favourite on raw-talent alone and I wouldn’t be surprised to see some of her people make it really far into the live shows. Cee-Lo isn’t my favourite; he’s the one judge who I think lets his persona get in the way of his personality, never letting us see the person underneath all the grand crazy. But Adam Levine makes up for that. A couple weeks ago, Entertainment Weekly published an article in which the author begrudgingly admitted “okay, Adam, we like you, we really like you”, a point that had me in stitches and knowing head nods. Adam Levine shouldn’t be a likable guy. His tattoo sleeves, lingerie model girlfriend, rock star status, affinity for naked photo shoots, tight jeans, competitive nature and cocky EVERYTHING should render him intolerable. But this is The Voice, where damnation on the basis of style (whether it’s too much or lack thereof) just isn’t a thing. Adam’s sweet, and hilarious, and genuinely joyous- which is amazingly refreshing. He looks like he’s having fun, so his lighthearted bickering with Christina and macho one upmanship with Blake is fun too. 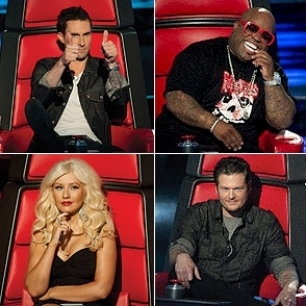 The Voice is a place where that big-boobed blonde from MTV gets to remind everyone that she has unparalleled vocal technique, where the downhome country man can prove his outside-of-the-box appeal and where a stylish self-professed “douchebag” can make a name for himself as a quick-witted, well-intentioned and savvy good guy. We’re two weeks into the Battle Rounds now and, sadly, quite a few of my favourites have gone home. I would have given the “Free Fallin'” battle to Adley Stump without a second thought, and “The Power of Love” to Monique Benabou in a much closer race. I’m not a Chessa fan at all, so I was sad to see the excellent Angie Johnson go home on “Total Eclipse of the Heart” in her place but I’ll admit that even I might have contemplated keeping powerhouse Jesse Campbell (which Christina did) over one of my favourites, Anthony Evans (their battle of “If I Ain’t Got You was the most epic so far). Jordis Unga was the only battle winner from the first episode I was sure should have won (I was apathetic to the Tony Lucca-Chris Cauley “Beautiful Day” matchup), but week two stepped it up with rightful wins across the board for Sera Hill, Charlotte Sometimes, Juliet Simms, Kim Yarbrough, Lindsey Pavao and (my God he’s good!) Jamar Rogers. As inescapably revealed in the previous paragraph, I’m invested in The Voice. I’m not sort-of invested in The Voice the way I am with The Amazing Race (it’s so repetitive! I basically tune in each week to see if Rachel will cry), I’m invested the way I used to be with American Idol, back when it didn’t feel so soulless, so straight-white-boy-with-a-guitar skewed, so image-driven. 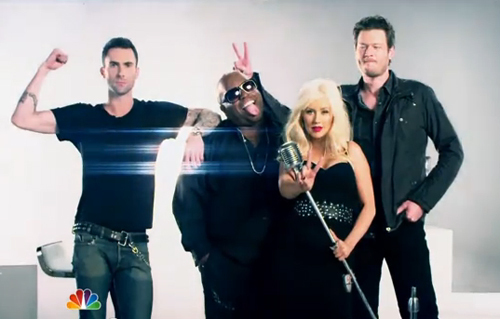 The Voice is the show to dethrone the reality TV monarch- Idol just doesn’t know it yet.